We exist to serve others by showing God’s love in practical ways through meeting the needs within our communities and spheres of influence. Simple acts of personal kindness can open hearts to the love of Jesus for both those being served and those serving. LIFEchurch is made up of individuals who are using their gifts and talents to glorify God by serving others. Servolution is the way that we activate people to serve in our community. Every year, we have a few different large events and initiatives that we use to reach our community and the surrounding areas. The holidays are a time of family, friends, food, and generosity. We believe that every family deserves to share a holiday meal together. For Servolution: Thanksgiving, the people of LIFEchurch fill bags with Thanksgiving meal groceries to be delivered to the homes of people in our community who could use a hand. It's our way of saying we care, no strings attached. 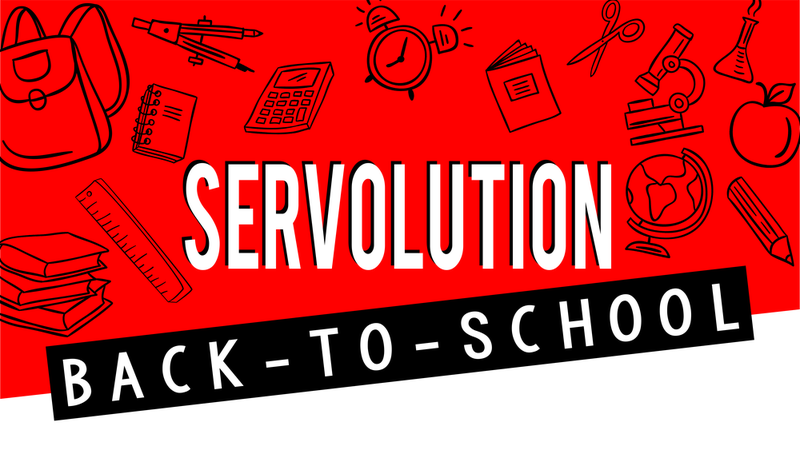 Servolution: Back-To-School is designed to help families with the expense of students going back to school. We generally give away free tennis shoes, backpacks, haircuts, groceries, and school supplies. These items have been purchased and donated by the people of LIFEchurch and our community. We also collaborate with local businesses and Not-For-Profit organizations including funding provided by Community Foundation of Johnson County.